Iman here: In an ideal world, I would have gone to the flagship restaurant, Manresa, Chef David Kinch’s 3-star Michelin restaurant in Los Gatos. 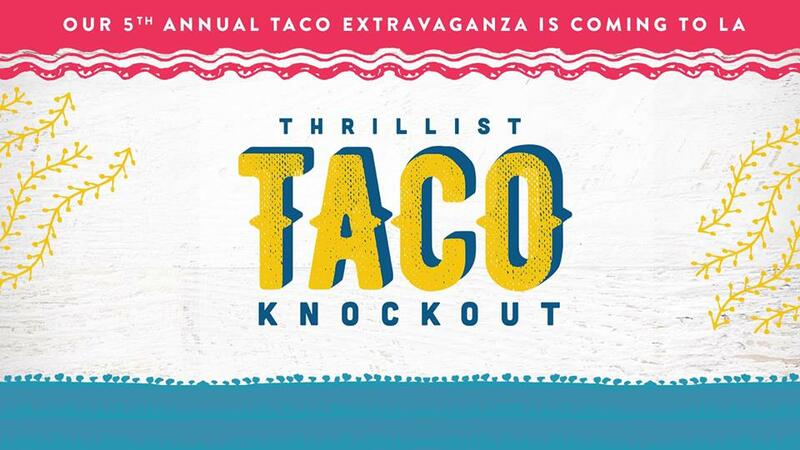 But, I don’t make the kind of money you need for those 4-dollar sign restaurants (…yet). So, I went to the next best thing – Manresa Bread, the bakery that grew out of the restaurant, with two locations in the Bay Area (Los Altos and Los Gatos). The bakery started as the Manresa Bread Project when Avery Ruzicka became the baker at the restaurant in 2012, where she used to put together a bread course to highlight four to five different types of bread. How amazing does that sound?! The project eventually grew into this offshoot bakery in 2014. 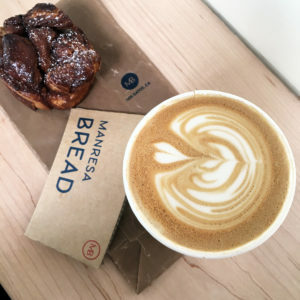 In addition to selling their high-quality breads and pastries, Manresa Bread uses local and artisanal products and also has a full espresso/tea service. I popped into the Los Altos location one afternoon, luckily catching it before it closed, and grabbed one of their monkey breads. The cafe is pretty small, with a counter for seating inside and a few seats outdoors. This is definitely a spot that is grab and go rather than a kickback spot. Manresa Bread serves Verve Coffee at their bakeries, and the barista made a really good latte! I didn’t even add any extra sugar—a rarity for me. That monkey bread was sticky, sugary, and flaky. It was perfection and I was sad when I ate it too quickly. Manresa Bread hopes to become the South Bay’s go-to bakery. If their delicious pastries are any indication, they are well on their way to doing so. I personally think is awesome since San Francisco and the East Bay has Acme Bread locations near them… everyone deserves good bread! Next time, I hope to take a loaf of bread home and a lot more monkey bread. A lot more. Paula here: Not that I’m a chocolate snob, but… I totally am. I feel like anything chocolate should be consumed like a love story. Deliciously intriguing. Renegade Chocolate has taken chocolate in my life to a completely new level. The owner Alex, has a passion for this sweet treat that started 6 years ago when she was studying pastry arts in college. She prides herself in using the best ingredients possible and using the world’s finest Belgian chocolate. Trust me, this makes a difference. 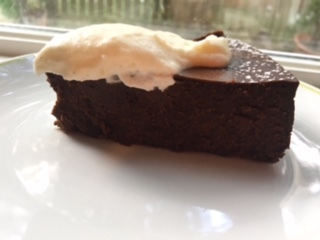 I was able to consume this beautiful, decadent Bourbon Torte with Vanilla Bean Whipped Cream. I thought I liked bourbon before, but now I’m obsessed. I can’t even explain how remarkable this was for me to eat. On a scale from 1-10, the flavour is a 12. It is hands down, the best torte I’ve ever tasted. Ever!! If you’re looking for delicious, absolutely stunning chocolate or sweet treats, check out Renegade Chocolate in Uxbridge, Ontario. Isabel here: Sylvan Park is an established neighborhood in one of the most desired parts of Nashville. What makes a great neighborhood so special is a perfect balance between peaceful, tree-lined streets and its walkability to fun things! This was lacking in Sylvan Park until recently. There’s the neighborhood bar and now the BBQ joint, which is all wonderfully fun, but there was still something missing. Enter answer. 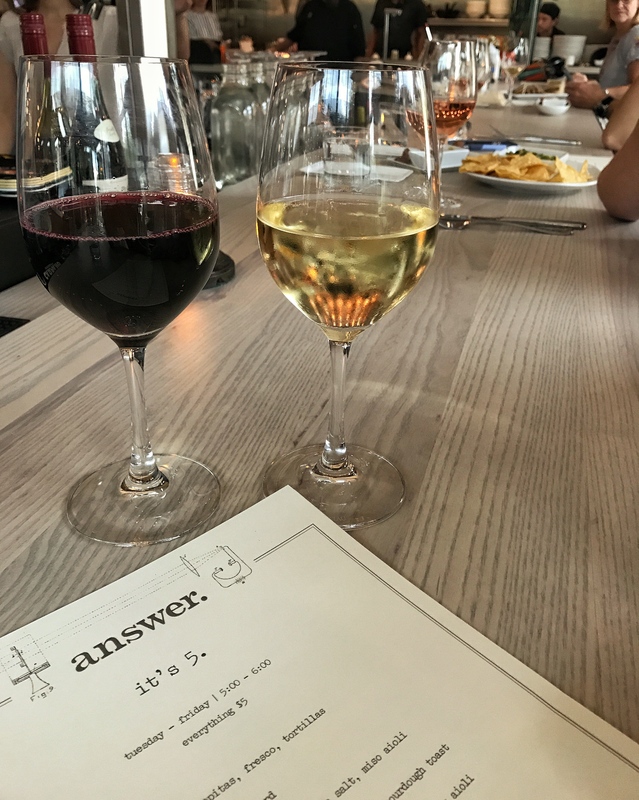 With a beautifully curated food and beverage menu, a simple industrial sheik interior, and a killer happy hour, it’s just what Sylvan Park needed to stay relevant in our growing city. My husband and I rode our tandem bike down for happy hour drinks this week, and it lived up to the hype. This happy hour, Tuesdays – Fridays, is a bit short, lasting from 5 pm – 6 pm but everything on the happy hour menu is only five dollars. I appreciate the simplicity of the menu with an assortment of small plates, three choices of beer, house wine (red, white or rosé) and a selected cocktail. Although we weren’t there for food, I was able to look over the regular menu which looks perfectly balanced in its simplicity and decadence with exciting innovative dishes and a fantastic drink selection. I can’t wait to go back for more! Stay tuned for next week when we feature Julianne’s favorite nutrition book and the upcoming Bubbles fest.